I’m Dusan Mirkovic, your neighbor. Are you expecting a movie such as “Honey, I shrunk the kids” or something similar to “Gulliver’s Travels” then you’re going to be a little bit disappointed. 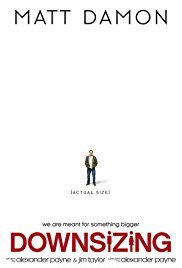 No, “Downsizing” is not a comedy about shrunken people. And it’s certainly not a fairytale where little people capture a giant man. Or am I wrong about that? Maybe it is a bit of both. First of all, “Downsizing” is funny at times. The whole process of shrinking and the way they travel with normal people are unique ideas. The first half hour or so you look with child-like amazement at it all. Just like children who visit “It’s a small world” in Eurodisney for the first time. Then the film gets a more critical character in which the ecology and our materialistic thinking are denounced. Just like in “Gulliver’s travels“. That ancient story was also a satirical view of the English and European society. Let’s get small and rich at the same time. The starting point is, to be honest, reasonably ingenious. Do you have a limited income and is it hard to come by every month, as Paul Safranek (Matt Damon) and his wife Audrey (Kristen Wiig) experience? No problem. The Norwegians have perfected the technology for shrinking people. Trouble-free and without side-effects (besides the fact you’ll be completely hairless and toothless during the starting procedure) one can reduce your body to a mini-person of about 13 centimeters. Initially, the intention was to significantly reduce our ecological footprint. But the reason why most chose to get small, is the financial benefit you have of it. The cost of living is much lower and everything only costs a fraction of what it’s worth in real life. “Ok, that’s simple.” thinks sheepish-looking Paul. So he and his wife decide to take the step. They sell everything they’ve got and they buy a spacious villa (Playmobil size) in Leisureland to retire for the rest of their lives. Until then, it all feels like a fairytale and sounds funny. But then the socially critical atmosphere sneaks into the film bit by bit. First of all, there’s the report on how scaled down immigrants cross the borders of the U.S. very easily. That’s where the Vietnamese environmental activist Ngoc Lan Tran (Hong Chau) appears. Then the Serbian Dusan (hilarious role of Christoph Waltz) is introduced. A cunning businessman who imports luxury products from the ordinary world in smaller quantities and distributes all of it in mini-people’s country. Voila, that’s where the macroeconomics and capitalism aspect comes into play. And finally, poverty turns out to be an aspect in this miniature country as well. That means there are people there who lack a decent health care. The frivolous mood disappears systematically (but still here and there another comic note) to make way for more serious subjects. A movie that brings up lots of questions. Maybe the second part is a turn-off for some. The romantic part felt rather forced in my opinion. But otherwise, I thought it was a pleasant film. A film with ups and downs. Matt Damon plays the subdued Paul in a great way. But it’s mainly Hong Chau who steals the show. An energetic person who talks in an edgy way with a cynical undertone. A magnificent piece of acting. In the end, the problem of the ecology and the survival of our planet was slowly being pushed to the background. And maybe the makers of this film have put too many ideas and philosophies into this film. But the result is that it’s almost impossible to get bored during this movie. However, I was just wondering. The removal of hair is a necessity. But what if you suffer from ingrown hair? And bald people? Do they get a reduction? And who makes all the daily necessities such as a comb, hair dryer or drill? I don’t think these are ridiculous questions.